. . . and babies make four. : On the sixteenth day of Christmas . . .
On the sixteenth day of Christmas . 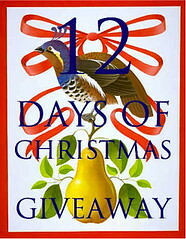 . .
Well friends, we've reached the sixteenth day of Christmas and we've come to the final giveaway as well. Before I tell you what you can win, I just want to say thank you to everyone who has visited during the past 15 days. It has been fun to share some of my favorite things with you and I've loved reading all your comments. Someone suggested that I should consider regularly sharing a "Friday Find" and I just might do that. And now to the last giveaway. This one is a gift from me. I know that many of you who read this blog have a daughter, a granddaughter, a niece or a special little person in your life who is Chinese. And you may have discovered, just like I did, that it is not easy to find an Asian doll who actually looks Asian. I found this doll from Karito Kids and I think she is just lovely. So, for this final giveaway, one lucky person will win a Ling Karito Kids doll. And even if you don't have an Asian little girl in your life, I think Ling would be cherished by any little girl. To enter this giveaway, simply leave a comment. Also, as a thank you to those of you who are followers of this blog, you will be entered into the drawing too. If you are a follower and you leave a comment, you'll get two entries. If you'd like to become a follower, that would be great too. I know I've said it before, but I'll say it again, I am humbled that anyone other than my mom takes time to read this blog. Truly, I am. And don't forget that there are still numerous open giveaways you can enter if you haven't already. Also, I 'll continue to post a winner each day as the giveaways close. Oh she is lovely. Here's my post and I do follow. I signed up as a regular follower, but trust me, I've followed you since the beginning. Your kindness, generosity and talent in arranging and sharing through these 16 days has been wonderful. Blessings to you this Christmas season. What a fabulous doll! If I win I'll buy another one as we also have twin girls born in China! They would adore the dolls. What an absolute beautiful doll. Mylee has been asking Santa for a Chinese baby/doll and I have not been able to find one as gorgeous as this one. Even the AG dolls don't really look Chinese. As much as I have enjoyed all of your giveaways I truly think this one is my favorite and I so hope I win. Thanks so much for doing this. It has been so much fun! I love your blog Kristi and I love reading what your beautiful twin daughters are up to. Thanks for sharing your life with us. The doll is gorgeous!! I think we have been following your blog ever since China, lol. And not just because your daughters are adorable, or your pictures absolutely stunning. You have a wonderful way of writing about them and their daily antics. 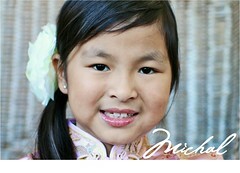 She is adorable and might look just like me (I'm chinese too). My dauther will cherish this forever, and so am I. Thanks Kristi for all the fun in the last 16 days and looking forward to Friday Fun! Ling is a stunningly beautiful doll, just like our girls. Marissa thinks she is "wonderful" because she looks like her. She ran to get a China Sprout magazine to show me the same doll inside. She had noticed and remembered her! Kristi, thank you for the fun and creative " 16 Days of Christmas." Please keep up your blog for many years to come!! Hi, I just wanted to let you know that I just could not wait for this giveaway so I went ahead and ordered one for Mylee for Christmas. I think I am more excited about it than she will be. If I win (and that is a big IF), I would like to have a raffle for it on my blog to help us raise money for our adoption of our son Drew who we are hoping and praying to have him before he turns 4. Thanks again for all the great ideas. Thank you, Kristi! I have enjoyed watching your beautiful daughters grow from the time you brought them home from China. This has been such a fun activity for the holidays and I have to thank you for some great gift ideas! I hope that your family has a lovely, joyous Christmas! I would like to thank you and your girls, for making my days so beautiful and fun. I hope this new year brings you and your lovely family joy and good health. Could we meet you in January? We are planning to visit Chicago and hope to see you all after so long. I came to "know" you through moonbeam, before we left for China for the adoption. I got Emily in August 2005. What a fantastic time! PS Thank you for your wonderful recommendations of the restaurants to my husband and his coworkers. We may be able to try them as well. What a wonderful gift!! And, don't forget that Nanas and Grandmas of these blessings from China read your blog too. Best wishes to your family. Hello, I have so enjoyed reading your blog over the years, yes years we have been waiting for our daughter in China.Thank you for sharing your experiences with us! I just officially became a follower of the site. And thank you for adding my name to the drawing for the doll. I would love to win it for our soon to be daughter Grace. Happy Holidays and thank you for holding all the giveaways! It has been fun to find some new sites and revisit some old friends! She really is lovely! Thank you for sharing all your wonderful finds! It's been so much fun! one of you best finds yet!! I know a certain little princess that would love one of these:) Thank you for sharing. Oh and yes! What a great idea for a Friday Find!!! Oh my... I didn't think anything could top that Matilda Jane giveaway, but this one is close! She is a truly lovely doll... I had seen her, but not close up and her features are truly striking! Like you, I think it's so hard to find anything that truly portrays Asian dolls as just that: Asian! I know my Sophie would adore this doll... she's got a birthday coming up in January! Thanks so much for this giveaway, it's been SO much fun to follow along! And your giveaways have been marvelous!!! I haven't won anything, but I am very grateful for all your effort in putting this together for us! Awesome, thanks for the chance. G would love this. She is really starting to enjoy her Asian Bitty Baby so I think she would enjoy this as well. your 16 Days of Christmas have been a delight! Thanks so much for taking the time to share so much with us! 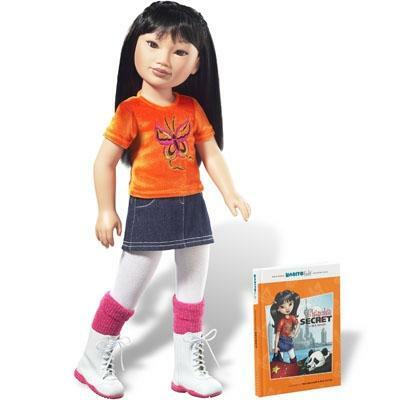 Zoey would love this doll- you are so right- it is so frustrating finding dolls that actually look asian! Very cute dolls! Beautiful, like your girls! Thank you for offering a fun give away during the holidays! Can't wait to see you in San Diego! I love this doll. In fact, I found this doll back in the fall and sent the information to Gail at "Aging with Grace and Strong Will", as I think the doll looks like Gail's daughter. The doll is lovely! She is beautiful! I have loved your days of Christmas...it has been so much fun and so find new products! I could be wrong but I believe I had a Karito doll when I was a little girl. She was Hispanic...which is cool since I went on to have my sweet Monkey baby! Thank you for taking the time out of your day to post all these wonderful drawings. I have loved this doll for a long time. She is really fabulous. Thanks again for doing this. It was really fun. Kristi - I've been a follower for a lo ng, long time! Whenever I feel the need for a little creative inspiration - I come here! Keep sharing! I love your ideas, photography and stories! Merry Christmas! I LOVE your blog, your ideas and your darling girls. Thanks for sharing! Thank Kristi for sharing such wonderful things with us the past 16 days! You're right, it is so hard to find a doll that looks Asian - and this one is perfect! You're generosity is much appreciated. What a lovely doll! My daughter would love her for sure! Thanks for your great giveaways! I have followed your blog for over a year and think you and your family are amazing! Have a wonderful holiday...all the best in 2010! What a beautiful doll! Would love to have my name in the drawing for my daughter and I'm a follower too! I totally agree with Felicia -- that doll looks a lot like her Grace! Have a great weekend! What an amazing, thoughtful thing you have done this holiday season. the daily surprises you shared were so much fun. I have followed you since myadoptionwebsite but I just signed up the be a follow on your blog, even though I read it all the time. It is nice to keep up on other Maonan girls like my daughter and to know they all spent time in the same orphanage. Have a wonderful Christmas and thanks again for you kindness!! She really is beautiful and looks a million times more Asian than the "Asian" American Girl doll I just purchased for one of my daughters. The AG doll doesn't look Asian AT ALL! She's gorgeous! I've *so* enjoyed the 16 days of xmas! Maybe next year it'll be 25?! I adore this doll! Even if I don't win it, I will have to eventually buy one. We have been waiting for Lily to come home to us from China now for already four very long years. (I have written you about that before and we are still waiting.) I have bought her a Christmas present every year we have waited for her. She is already a gift in my heart. Merry Christmas. By the way, of course I subscribe to your blog and have for probably close to three years. It has helped me get to keep holding on, knowing that one day this will happen. We will be rejoicing. I have felt privileged to see your girls as they are growing up. And what beautiful young ladies they are. Oh she is just a gorgeous doll! Thank you so much for doing these giveaways - it is so much fun:) I think you should do the Friday Finds - you are SO good at this!!! 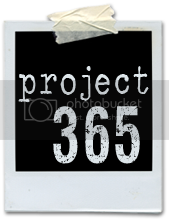 Kristi~ I have been following your blog for a long time. I love your kind spirit & you have a heart of gold! Your husband & daughters are very lucky to have you in their lives. You are one of the sweetest bloggers that I visit almost daily. Merry Christmas to you & your family. All these fun contest say a lot about you as well. Oh my girlies from China would just love her to pieces. Thank you so much! This is wonderful! Merry Christmas to you and your beautiful family! Thanks for the invite to become a follower. I don't remember who's blog I saw you on but I have been enjoying yours too. The dolls is amazing! My girls love to read! I have wanted this doll for a few years. She is the prettiest and most "asian" looking doll. The girls would love her, well that is after I purchase second one so that they each have one:). I've been a follower since we got our MaoNan referral in 2005. I love this doll! I've had my eye on her for a while now! I would absolutely love to win this for Caroline! What a great idea! And now I am done using exclamation points!! Okay, now. Beautiful. I have been following your blog for a long time and was not aware that I could actually sing up to be a follower, so I just signed up today. I think the Friday Finds is a great idea. She is really cute. My daughter wants a doll like this for Christmas. She is beautiful! Thanks so much for this opportunity to win some pretty amazing gifts. You are too kind! What a lovely doll. The level of detail is just perfect! She is a beautiful doll. I've seen them online before, but had forgotten about her until you posted this. Thank you so much for this fun 16 days. Each morning I looked forward to seeing what you posted next. Maggie loves her dress from Pretty Me and I have lots of new places to shop for the spring! I would love to win this doll for my niece!! She was adopted from China and loves Chinese baby dolls! I have been trying to find one of these but our local store keeps selling out....would love to win, my girls would love this. What a beautiful doll! I check your blog almost daily and have been reading it since you started it. 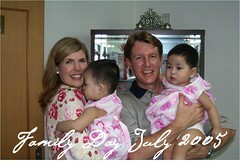 My husband and I were considering adopting from China at the time and you had just started your blog. I've been hooked ever since -- you are a fantastic writer and I'm enjoying watching your beautiful daughters grow up. I think a "Friday Find" would be a fantastic idea!!! Merry Christmas and Happy New Year and Happy Birthday to you and the girls. Always love checking in on your blog! Your girls are beautiful! I'm not usually very lucky with drawings but I'm certainly putting my name in the hat for this one. Have a wonderful and blessed Christmas! What a great doll...thank you for sharing all these wonderful links to fabulous finds!!! I first saw this doll on one of the sites we visit, maybe "adopt twins"? Anyway, someone had done a pictorial comparison of the Karito Kids Chinese doll and the one by American Girl. The Karito Kids doll is much more realistic. I recently got one and she looks very much like my twins! (So please don't include me in the drawing). Thank you so much for this fun Christmas giveaway. You are so generous with your time, talent and treasures. I really enjoy your blog. It inspires me to be a better mom because you are truly the best. I often wish I could pick up the phone and call you - I feel we have a lot in common. Identical twins who were born in Guangdong and are close in age, we even had the same guide! We also have similiar intrests, of course, I am nowhere near as creative and talented! Thanks for taking the time to share. What a pretty doll! These giveaways have been so fun. Thank you for organizing them Krisiti. I have been a follower for years now but don't really know how to become a "follower". I am waiting and waiting and waiting.....Merry Christmas to you all and thank you for sharing the lovely moments of your lives with us! I've been following your blog since your referral. I'd love to win this for my own Angel Face, who we brought home from China in April, 2006. Thanks for the offerings, they've been fun and unusual! Love following your blog, your daughters are darling. You give those of us that are waiting hope that our day will come soon! I am always looking for asian dolls so I love your choice. One of my favorites is Paola Reina asian doll, made in Spain. I'm sure my daughter would love this doll! She was born in Korea and we just celebrated her one year family day yesterday! I am thrilled with this giveaway and can't thank you enough for the fun I have had over the last 16 days. Thanks for sharing and as always I will continue to follow you blog and you wonderful family. Take care and Merry Christmas to you and your family. 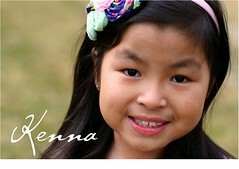 I have 2 nieces adopted from China and this would be a beautiful gift! I have truly enjoyed your blog. It IS difficult to find a nice Asian doll, isn't it? I think you found a winner with Ling, though. It's been so much fun "shopping" through your give away. WoW, this is one beautiful doll. 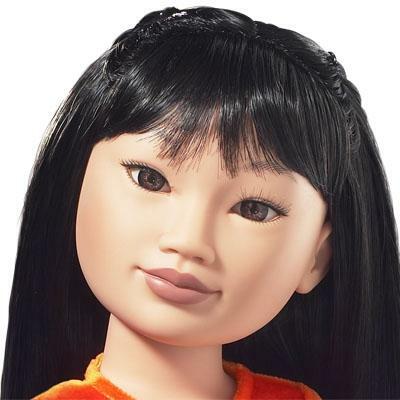 I have not found one that looks "asian" my oldest is not into American Girl dolls yet so this would be a great surprise for her on her 6th birthday coming up in a couple of months. This has been such a fun and wonderful giveaway. Thank you for all your kindness. Your girls are beautiful! What a truly gorgeous doll! My girls would love her! What a great find! Yes, Asian looking dolls are very hard to come by. What an adorable one you've found. I so appreciate you sharing your great finds with all of us. I, too, have followed your blog since right after you brought your girls home (and I was still waiting), and you've been so generous in the past to share "adorable stuff" information with me (I ordered the headbands from the store near you to be shipped to me in San Diego). Look forward to seeing your girls grow up! This really is a great find! I have been search for an Asian doll. Thank you for all your great finds and the links to them. What a fun and generous days of Christmas. Thanks for all of your wonderful give-aways! Very cool ideas - I hope I'm able to visit many of them soon! The doll is, of course, amazing! thanks for the opportunity. merry christmas. I have had my eye on this doll for a while now, but was waiting until my daughter was a tad older. I'd love a chance to win this for her. I have followed your blog for ages. Your kiddos are so cute and funny, and your creativity inspires me. Thank you for sharing! The Karito dolls are wonderful - we bought Ling 2 years ago for our oldest (now 7) and Cate (5) has been carrying that doll around for the last week insisting her sister give it to her - so the timing couldn't be more perfect for this give away! I've read your blog ever since our Moonbeam waiting days - I love taking pictures of our girls and your photography and poses are always inspiring...just became an official follower for this raffle! Thank you for your wonderful blog, and for this fun giveaway. Happy holidays! What a cute doll! I've been on holidays so I've missed most of your 12 days of Christmas but I'm enjoying looking back over at all the fun you've been having! I've been admiring this doll for months. What a blessing your blog and your friendship is to so many of us. Merry Christmas to you and your precious family! Thanks for sharing this doll. I love it. Thanks for all the fun!! Give to Michele, give to Michele, give to Michele!!! We love Michele so so so so so much. She is an incredible Ma and wonderful teacher. She gives to her community with her whole heart. Pretty doll! It would be fun to win. Thank you for sharing your favorite things! I have already ordered some of them. I love following your blog and what an extra bonus that you have been doing this amazing giveaway. I sure hope I am signegular follower! This has been sooooo much fun! I just love the idea of 16 days of Christmas. You are too sweet! I LOVE this doll! I also love your christmas give aways. So cute! Addie (born in China) would LOVE this doll! Kristi - Thank you for all the fun. You gave me so many great gift ideas. She is a beautiful doll. I have been gathering special keepsakes for a dear family waiting for their referral. I cannot wait to give her a baby shower! Oh, my, she is gorgeous!! You're 16 days of Christmas has been such fun! I'll definitely be visiting many of the shops you shared with us! Oh, I haven't seen her before! She is lovely and you are right it is next to impossible to find an Asian doll that really looks Asian. That is such a beautiful doll. I would love to win. I saw this doll today....beautiful! Have always enjoyed your blog. And, it because of your stories and photos of visit to Door County that we are going to hold our adoption reunion - Viet Nam group there this coming year. We have one family who lives in WI but has never suggested it. I was the one after looking at your blog- how there! 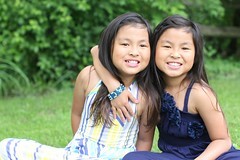 lol I have two girls (7 and 4) one born in Viet Nam and one born in China and true sisters at heart. The light of my life. I love taking photos of them and it is always a pleasure to find another mom who has the same passion for photos and the "doing the details in her daughters lives". I have been a follower for a long time, found you through my best friend who bright her daughter home three years ago. I have a felling she would adore that doll. I now have a little girl of my own, and you have given me so many ideas I can't wait to use as she gets older ... whether it be your crafty side, the adorable clothing the girls wear or your photography. And now, I've bookmarked a lot of etsy stores I'll be visiting! Have a blessed holiday season, thank you for the past 16 days! I've had my eye on her for a long time! Joining as a regular follower too. My wife wants this one! How lovely! I'm a follower, too! That is a beautiful doll, and like you said, any little girl would love to have it. Thanks so much for such fun and exciting giveaways. This is a beautiful doll. All the gifts have been wonderful. What a great doll. I started reading your blog a few years ago before we even started the adoption process and now we have a 2 year old from China!! Thank you for the wonderful "chances" during this season. The doll is beautiful. Love this doll! She's gorgeous! Would love to give my little asian princess a doll that is precious like her. I don't know if it's too late to enter this one--I haven't checked your blog since we got to China because we weren't able to see our own blogspot blog. But, lo and behold, I checked just for fun today, and yours comes up! Darn--I should have checked earlier because I missed the last several contests! !